Here is my fourth set of US postage stamps. These are my Justia stamp series of joy, love and peace. 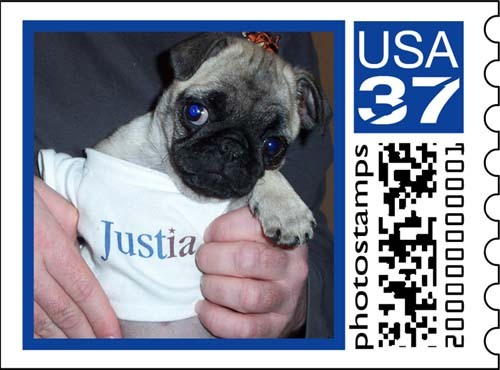 Also Justia just released translation services for their Web sites in over 80 languages, and I am trying to show my support by wearing Justia clothing to get Justia to translate Web sites into paw text for pup users. Series 4 - Number 1: This is me in my teddy bear's Justia t-shirt from when I was a little puppy. I gave this shirt back to my bear and got a new favorite t-shirt over the holidays. Series 4 - Number 2: This is me taking on a bigger dog in a dog fight at the dog park. I like this picture. And here are my previous Photo Stamps. 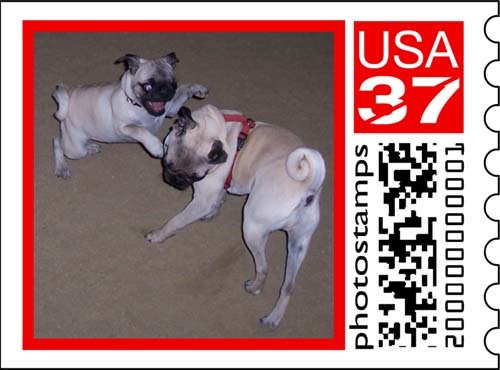 The Stamps.com's photo stamp service (http://photos.stamps.com) is currently on hiatus while the Government of the United States of America studies the situation. And once again, let's hope they allow it to continue!! !.